When photographing my latest batch of figures to archive, I tried something a little different with the light box. My photo booth actually folds down into a flat briefcase-like thing. The outer fabric is actually black, and I noticed that this was bleeding through the white back wall when the booth was set up. To counter that, I places some white printer paper in-between, acting as a sort of color buffer, if you will. Aside from that, I played around with my camera’s white balance settings, trying to get truer colors that what I had been capturing before. My camera still tries to make the white photo booth the medium gray calibration color, but I think I’ve managed to tone it down. I’ll keep working on it, of course. With my new digital camera, I’m trying to familiarize myself with all its myriad functions. It took me quite a long time to nail down how best to use my old point-and-shoot, and even then I learned a new function a few months back that helped with the photos I was taking. No I’m back at the bottom. I know sort of what I want to accomplish, but not how to consistently get the results. So it’s research time. Guess I’ll be spending time browsing the manuals and internet videos! I got a new digital camera! And unlike my previous ones, this is actually a DSLR. 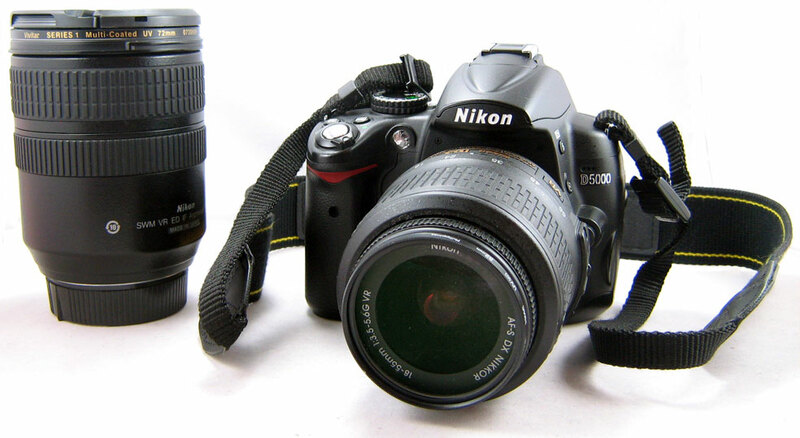 It’s a Nikon D5000 with two different zoom lenses and an 8 gig SD card. Since this was actually a used camera,I got everything (and a camera bag!) for less than the cost of a new camera alone! Now I just gotta figure out how to use the thing!